We Test Out Page Brite – Is It The Reading In Bed Solution? If you like to read a book at night Page Brite says it’s the way to go. It’s a page-sized magnifier that has also has lights so that you’re supposed to be able to see what you’re reading more clearly and under optimal lighting conditions. It looked like a pretty good fix to a common problem, so we picked one up and tried it out and are here with our findings. There isn’t really the perfect solution for reading in bed, but many companies are trying to figure it out, because it’s a problem many or us are faced with. If lights are too bright, they disturb your partner, not bright enough and it makes it too hard to read. So when something like this comes along and promises to not only light up what you’re reading, but also to magnify it so it’s easier to read, it will get more than a few takers. 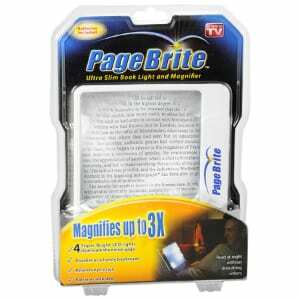 Page Brite claims that it relieves eye strain, and that its four LED lights light up the entire page, stay cool, and last for 5000 hours. They say that their clip allows you to affix it to your book so that you don’t have to hold it in place. They say that it’s lightweight, allowing you to take it wherever you go, and also to use it for long periods without getting tired of holding it. The reason a product like this will be so popular is that it attempts to solve a problem that many of us have. Reading in bed is really satisfying, getting nice and cozy and soaking up the words, but getting the right lighting can be a problem, especially if your partner is trying to get some shuteye. Regular lamps are too bright, and even some reading lights can be overkill. They say that similar lighting and magnifying products can cost as much as $40, but they originally sold Page Brite for $10 plus shipping which also got you a mini version you could put on your key chain. They would double the offer for free but require shipping for both so your total came to about $24. However, you can find single units for $10 online and in stores. There’s actually more commitment with this than we originally anticipated. It makes it seem like this would be a pretty much hands-free way to go, but as it turns out you have to be very involved when using it. You have to hold it just far enough off the page so that the words get magnified to the size you want, and so the light hits it just right so that you can see the line you’re reading. Page Brite seems like it should work, the concept is solid enough, and it’s not the first light and magnifying combo to come along. However, when you go to use it you’ll quickly see that it’s more of a hassle than a convenience. You have to continually hold it in place, which would be fine if you could press it right up against the book. But you have to hold it out away from the book the whole time, which even though it is lightweight, it’s not something you want to have to do in addition to holding your book. Aside from what we didn’t like about it, we also found some other complaints from users, including the lights forming an X across the page. This is because they use four different lights, with the theory being that it lights up the whole page, and not just one section. But the light has to go somewhere, and when they all meet in the middle it forms a sort of square or an X that makes it hard to read. Also, the glare from the glass creates a problem, effecting the ability to see what’s on the page. The Page Brite just didn’t do it for us, but maybe you might have more success with it. We’re giving it a Thumbs Down. It’s an instance where it sounds good on paper, but it doesn’t quite work as a finished product. Perhaps at some point they will revamp this, fixing its inherent problems, or maybe another company will come along and make the improvements to it and re-release it as a new fix. We’ll keep a lookout for you, and update this page when we find a workable solution. There are other methods that are better than this. Most book lamps are not as bright as they depict in their infomercial, and can get the job done without disturbing anyone else. For the magnifying feature, a good pair of reading glasses works much better, and doesn’t require your constant fumbling with a magnifier. What do you think? Does Page Brite work or not? Does Banana Boat Sunscreen Really Work? Does the Duragloss Car Care Bucket Really Work? I’ve tried a bunch of night time reading lights because I love reading in bed, but have a roommate at college, and when I’m at home I don’t want to get out of bed to turn off the light. I haven’t tried this one but have through about it for a while. One of the things that I like about this design is that it evenly distributes light onto the page, so you don’t have to worry about readjusting the reading light, which is the most annoying part of using reading lights. What I don’t like, though, is that it magnifies the page. I feel like things like that give me a headache after looking at them for too long, and I’m sure if someone read with glasses it would feel even weirder. It would be nice if they made the light without the magnification, I think. I’d try it then.